My mom’s been trying for a couple of years to get me to consume black soy and black sesame powder. My uncle in Seoul grows the two ingredients just for my mom, has them ground at a local mill, and then ships the powder to her in Florida. He started doing this years ago when my mom first started to get white hair, swearing that it would make her hair turn black again. Obviously, I was skeptical. It took a long time, but I do have to admit that while she’s still salt-and-pepper-haired, she’s now more peppery than she used to be. I’m a really picky eater and made a face every visit home when my mom handed me the powder mixed with milk. I’m not intending to go gray anytime soon (although I did get my first white hair last year), so I needed more incentive to start drinking the stuff. She told me about the protein content and other nutritional value , and I decided to try to learn some more on my own. According to this article on NPR.org, black sesame is an excellent source of essential minerals and fiber. Black soybeans are apparently one of Dr. Oz’s favorite superfoods. And this article in The Japan Times indicates that black soybeans are more effective than yellow soybeans in preventing menopausal symptoms (hope I don’t have to worry about that soon, either). After finding more evidence of the health benefits of black sesame and black soy (thanks Google! ), I decided to figure out how to make the stuff taste to my liking. It wasn’t hard at all! 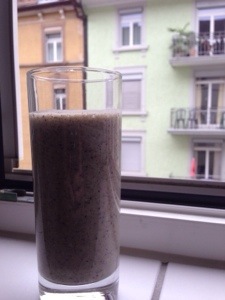 This is now a nearly daily ritual for me, I love it so much – it’s fast, filling, and healthy. You should be able to find the black soy and sesame powder at any Asian grocery store. Blend it up and that’s it! Something delicious for me to enjoy on this dreary Swiss Good Friday. Kahlua LOVES to ride around the house like this. My mom will just carry him while she goes about her chores. They are perfect for each other. This is also how my mom carried me when I was a baby (I need to dig up a picture). 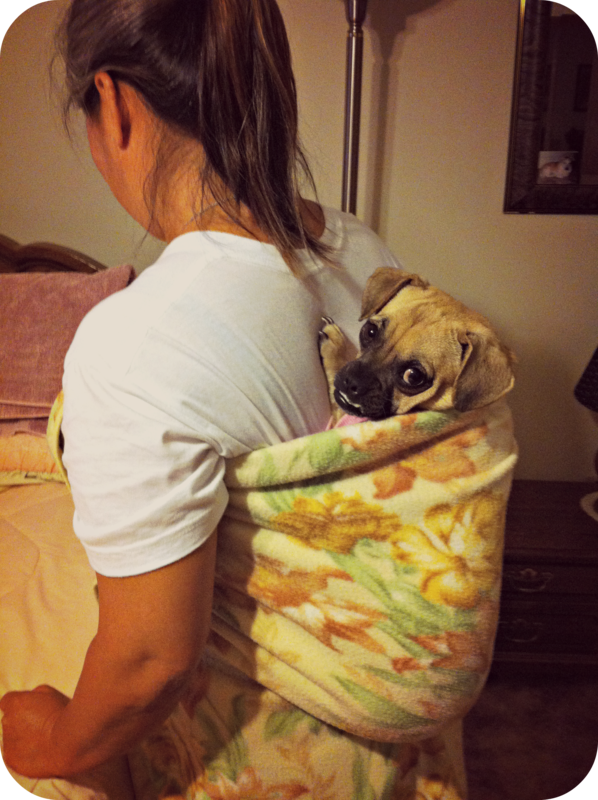 Now that’s talent – just a blanket wrapped and tied securely enough to be a comfy little puppy (or baby) carrier. Edit: Apparently this is called a podaegi (포대기), and while my mom just used a blanket and the sash of a robe, there are fancy custom-made ones which can be purchased online. When life hands you lemons, start a blog. I woke up this morning to a Google Now notification telling me it was time to leave for my flight to Alicante, Spain. As an American, I’m not used to having an Easter holiday, so I was pretty excited when my tennis instructor planned a tennis camp for all her students for that time. Five days of lounging around by the pool and taking the occasional tennis lesson in sunny Spain sounded glorious. But I wasn’t on that flight this morning — about two months ago I tore my ACL “skiing” in Davos (more on that someday) and it kinda ruined all my plans. I moved to Switzerland less than a year ago, and spending two of eleven months obsessing about a knee wasn’t exactly how I thought I’d spend my time. While I wouldn’t say that if I had the choice that I’d do it all over again, I have appreciated the opportunity to reflect on my life and learn more about myself and those around me. I’m looking forward to sharing my experience as a hapa daughter to a hyperactive, overprotective Korean mom and quiet, Southern vet dad, health and wellness, living abroad, dealing with an injury and healthcare in a foreign country, and anything else that strikes my fancy. I'm a half-Korean Florida girl living and working in Switzerland. This is where I post about life, being hapa, and my adventures abroad. For those who get asked, "What ARE you?"